Saint Anthony was born in the year 251, in Upper Egypt. Hearing at Mass the words, If you would be perfect, go, sell what you have and give to the poor, he gave away all his vast possessions  staying only to see that his sister's education was completed  and retired into the desert. He then begged an aged hermit to teach him the spiritual life, and he also visited various solitaries, undertaking to copy the principal virtue of each. To serve God more perfectly, Anthony immured himself in a ruin, building up the door so that none could enter. Here the devils assaulted him furiously, appearing as various monsters, and even wounding him severely; but his courage never failed, and he overcame them all by confidence in God and by the sign of the cross. One night, while Anthony was in his solitude, many devils scourged him so terribly that he lay as if dead. A friend found him in this condition, and believing him dead carried him home. But when Anthony came to himself he persuaded his friend to take him back, in spite of his wounds, to his solitude. Here, prostrate from weakness, he defied the devils, saying, I fear you not; you cannot separate me from the love of Christ. After more vain assaults the devils fled, and Christ appeared to Anthony in His glory. Saint Anthony's only food was bread and water, which he never tasted before sunset, and sometimes only once in two, three, or four days. He wore sackcloth and sheepskin, and he often knelt in prayer from sunset to sunrise. His admirers became so many and so insistent that he was eventually persuaded to found two monasteries for them and to give them a rule of life. These were the first monasteries ever to be founded, and Saint Anthony is, therefore, the father of cenobites of monks. In 311 he went to Alexandria to take part in the Arian controversy and to comfort those who were being persecuted by Maximinus. This visit lasted for a few days only, after which he retired into a solitude even more remote so that he might cut himself off completely from his admirers. 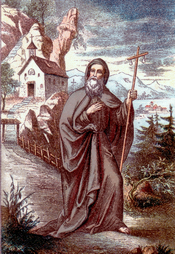 When he was over ninety, he was commanded by God in a vision to search the desert for Saint Paul the Hermit. He is said to have survived until the age of a hundred and five, when he died peacefully in a cave on Mount Kolzim near the Red Sea. Saint Athanasius, his biographer, says that the mere knowledge of how Saint Anthony lived is a good guide to virtue. Reflection. The more violent the assaults of temptation suffered by Saint Anthony, the more firmly did he grasp his weapons, namely, mortification and prayer. Let us imitate him in this, if we wish to obtain victories like his. Little Pictorial Lives of the Saints, a compilation based on Butler's Lives of the Saints and other sources by John Gilmary Shea (Benziger Brothers: New York, 1894); Les Petits Bollandistes: Vies des Saints, by Msgr. Paul Guérin (Bloud et Barral: Paris, 1882), Vol. 1; The Saints, a Concise Biographical Dictionary, edited by John Coulson (Hawthorn Books, Inc.: New York, 1957).